This is a post for my fellow academics involved in book publication. Back in my days as a TA for Craig Evans I had to do a scripture index for a number of his books. It is a beast of a job that I wouldn't wish on anyone. Seeing a friend working on a scripture index for his book reminded me of a tutorial I made a number of years ago. If you find yourself in the same position now, this tutorial may be of benefit to you. After doing a few indexes, I discovered a quicker way to do a scripture index utilizing some Mac applications. Below is the explanation. Be aware that it sounds (and is) complicated, but once you get going, it makes more sense. And despite it being a complicated process, it will save you a lot of time in the process. When you begin to work, be sure to hit Save frequently. In the View menu, choose “Show Notes Pane”. This will show you everything you are highlighting. Turn on the highlight mode. Now, whenever you highlight something with your cursor, it will be highlighted in yellow with Skim. Take note, when saving your PDF, Skim will make a .skim file with the same name as your PDF in the same folder. DO NOT trash this file, as it holds the highlighting notes. Once all items are highlighted in Skim and saved, export the highlights you have made from Skim. Choose File>Export. Choose for the File Format, “Notes as RTF”. Place a tab mark at the very beginning of the text. 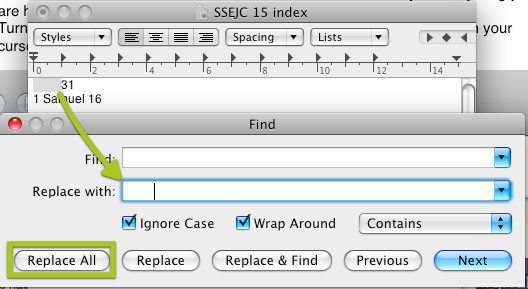 Then choose the Tab mark and copy it into the Replace with field. Now hit Replace All. Copy the paragraph mark and place it into the Replace with. Hit Replace All. Hit Save. The result is the pg.# [tab] scripture citation. Now we will fix all of the partial quotations. Open your PDF in Skim on the left side of your screen, and move the .RTF in TextEdit to the right side. As you can see, your Skim highlights are in the same order as your text file. Scan through your text file and add book names (be consistent, use abbreviations or full book names) and any missing chapters. In the image below, all of the bottom items need the book abbreviation added. I add “1 Sam[tab]” before the citations. I add the chapters to the bottom three as well. Do this every time you come across a new book— Do a Find and Replace for the full book name and the abbreviation type used in the proof. You need to be diligent all through this. All of the book name abbreviations need to be consistent. While filling in the missing info, you need to also make note of citations that are in footnotes. AFTER the citation put [tab]n.6. Hit Save every once in a while as you go through this second major process. Highlight your whole text file and paste it into your spreadsheet. (This may take a while for your system to do, as it is a lot of text you are pasting). The result is a 3-columned spreadsheet like below. Move column A (the page number) to the right side, with one blank column after column C.
Now in the first field of the blank column, you must make an equation to fix the page numbering (in case you didn’t notice, the page numbers are the page of the PDF, NOT the page number of your proofs). Look at your first item page number, and compare it to the actual proof page number. You will likely need to subtract 20+ pages. Your equation should look like this. (in the brackets corrects the page number, the “&” sign will add the footnote column to the column). Drag down the equation to fill that column all the way through your spreadsheet (grab the bottom corner and drag down). The first 3 columns are the info for your index. Now sort things alphabetically by column A and B. This will alphabetize your index by book name, with ascending chapter and verse items. Hit Save. NOTE: spreadsheets don’t understand the dash (-) sign. These will need to be placed properly in your final edit. You need a plain .txt file to be a middleman between your spreadsheet and your word processor (to strip out invisible formatting. In your spreadsheet app, export your file to .txt or csv on your Desktop. If you just made a .csv file, replace the .csv with .txt. Open the resulting file in TextEdit and delete everything (we did the last few steps just to get a blank file). Okay, the final tedious part. Book by Book, cut (CUT not copy) and paste the first 3 columns of info from your spreadsheet into the blank .txt file (i.e. TextEdit), and then cut and paste from TextEdit into your word processor. Once you do the cut and paste, hold down your alt/option key and drag your mouse to highlight all of the redundant book abbreviation names. Then just put the book name once at the top. Put any duplicates on the same line (eg. Gen 1:1 [tab] 6, 35, 109). They will all be grouped together, so do quick deletes and comma additions to bring them together. Citations that had dashes for verse ranges will be out of sequence. Cut and paste the whole line into the correct position. Repeat for each book. Add Major Headings as per the convention you are following, and sub-headings for each book. Older PostWhat if the Roman Empire in Jesus' Day Was 100 People?